Please email me at pressreliefprints@gmail.com about custom and collaboration inquiries. I will take these kinds of projects on a case by case basis and if time permits the work. I am always open to hearing ideas, so please shoot me an email! Below you will find some examples of previous custom work. I was asked by a few people to preserve the memory of bouquets that marked an import occasion, one wedding and one funeral. This is a fresh take on preserving the beauty of flowers. 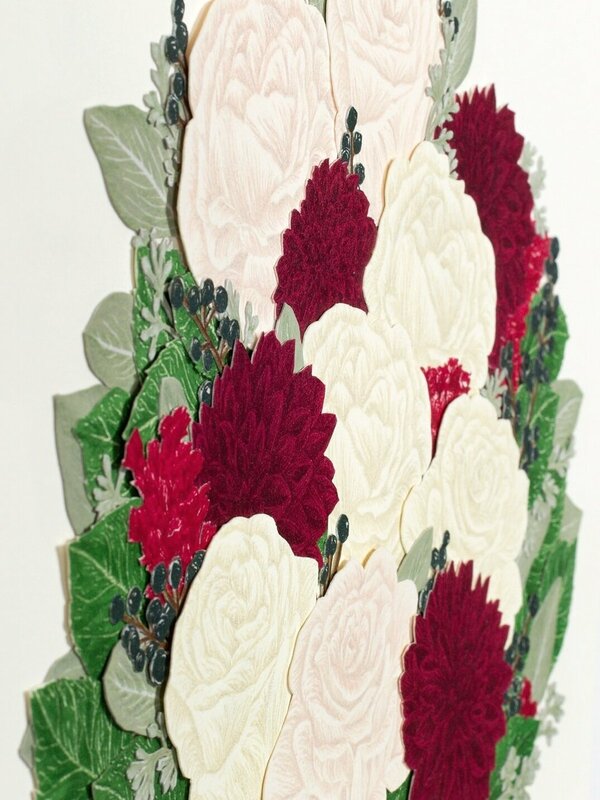 Each flower is a block print that was cut out and pieced back together to form its original form as a bouquet. Each piece is securely attached to the paper, however some parts are left popping off of the page to make them come alive. If you see one of my printed shirts and wish it were printed in a different color or printed on a different color shirt, it’s possible! If you see a design that I’ve created but it isn’t printed on a shirt and you want it to be, contact me. Pricing on custom shirts will vary. For finding the requested textile and shipping, a small fee will be added. If I have a shirt in stock, there will be no added fee. Feel free to email me for a quote. How long does it take you to get a custom shirt? If you want a shirt with a design that I’ve already created, please expect additional time for ordering the shirt if it is not in stock, and an additional week in order for the ink to properly dry and be heat set. If you are requesting a custom design for a shirt, the process of drawing and carving will take an additional 2-4 weeks. For a large quantity of shirts this will take longer.